[Amsterdam?, ca. 1665]. Engraved map (plate size 46 x 55.5 cm) on a single sheet of laid paper (49 x 57.5 cm), hand-coloured in outline, with the title in a cartouche at upper left and a scale at lower left. 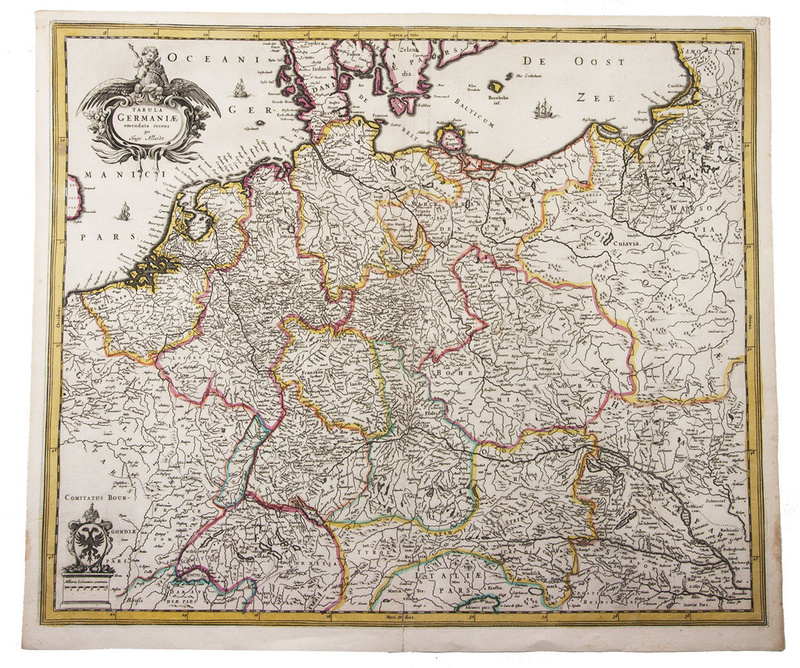 Very rare engraved map of central Europe by Hugo Allard (1624-1684), father of the prolific Carel Allard, showing Belgium, Germany, the Netherlands and parts of France, Denmark, Poland, Hungary, Austria etc. Another, later state of this map is known, signed by Joachim Bormeester (d. 1702) in the cartouche and with added latitudes and longitudes, which is equally rare. We could only trace two other copies of the present state, one in the National Library of Denmark in Copenhagen and the other in an atlas at the British Library. A small tear at the foot of the fold, not affecting the image, otherwise in good condition. Shirley T.ALL-1a #9; WorldCat (1 copy); not in IKAR.